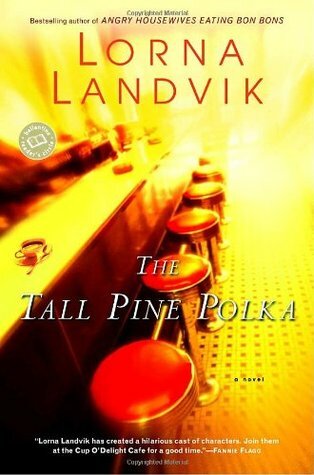 After a rough reading year, in which I will only be completing a half cannonball instead of the full cannonball I signed up for (but I feel okay about it since last year I signed up for a half cannonball and managed to complete the full cannonball), I decided to make my 26th book one that I know I love: The Tall Pine Polka by Lorna Landvik. This is the only book of hers that I have ever read. But I have read it at least half a dozen times in as many years. It arrived to me as a hand-me-down. My mother’s friend gave it to her to read, and when she was done she passed it off to me. I have not passed it to anyone since. The story focuses on Fenny and her loyal group of compatriots. Her social life revolves around her friends at the Cup O’Delight and their Polka Nights. The hub of this social wheel is Fenny’s closest friend: Lee O’Leary the proprietor of the cafe. This group is made up of the resident lesbian couple, the mayor, the shoe repairman, Heine, and the self-described poet who no one can really stand just to name a few. Fenny lives a quiet life in the northern woods of Minnesota with her friends, until a scout for a movie sees her in her family’s store and decides that she is the living embodiment of the lead character. What follows is a sometimes disjointed, but far more emotionally investing, story of what the change in Fenny’s life does to the overall picture of whom she is and the life she is going to lead. More characters join the crows, locations change, and lots of big life events take place. Some relatively minor with lasting impacts, others the matter of life and death. This book reads the way life plays out, once you take being discovered by Hollywood out of the equation. We’ve all known someone with an abusive spouse, a lover who isn’t telling you the whole story, a job you landed that you likely weren’t completely qualified for, and knowing that you’ve missed someone’s heart along the way. But somehow, we make ourselves a life, and Fenny and the rest of these well drawn characters do the same. They make a life. So, if you want an easy read with some fantastic characters pick this up. But make sure to brew a pot of coffee or tea, because the amount of caffeine these characters consume will make you jealous.